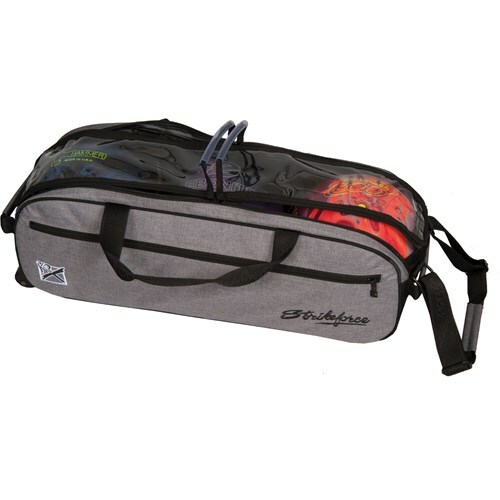 The Krush Slim Triple roller/tote features-1.25 inline wheels and dual zippers for entry from either end. Super Light! Weighs under 4 lbs! How much does it weigh? I put 3 15.3 pound balls in it, will it be under the airline's 50 pound limit? Without the bowling balls or accessories, this bag will be around 5-7lbs. Is there a separate compartment for shoes? Unfortunately, there is no room for shoes with this triple tote. Due to the time it takes to produce the KR Strikeforce Krush 3B Slim Triple Tote Stone/Black ball it will ship in immediately. We cannot ship this ball outside the United States.